Virgin Galactic celebrated the completion of Spaceport America, the first commercial purpose-built space port in Upham, New Mexico. Virgin Group CEO Sir Richard Branson proudly watched the ceremonial flypass of SpaceShipTwo over the spaceport on 22 October, 2010. 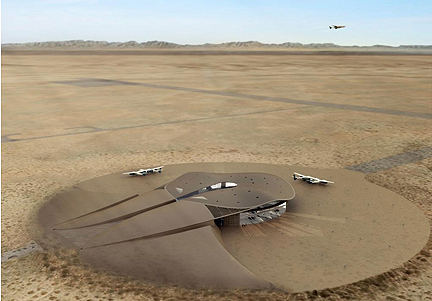 The spaceport includes a two-mile (3.2-kilometre) long runway called the "Governor BIll Richardson Spaceway" — 42 inches (1.07 metres) thick and capable of supporting every existing type of space craft currently in existence, PC Mag reported. The celebration included Sir Richard, Governor Richardson, and 30 of the 380 Virgin Galactic future astronauts. The gathering watched Virgin Galactic's WhiteKnightTwo jet carry SpaceShipTwo in a landing and flyover. The commercial space flights have been extremely popular, with the USD$200,000-dollar per flight deposits totalling more than USD$50 million already taken by Virgin Galactic. Branson said that he plans to be taking passengers into space in nine to 18 months.